Our mission at ACE is to find and promote the most effective ways to help animals. One of the ways in which the promotion part of our mission is fulfilled most effectively is through reaching those who are most passionate about helping animals but who have not yet been introduced to the concept of effective altruism. While some of our ads are aimed at existing EAs, the majority of our advertising efforts focus on the above audience for three reasons: (1) the large scale of this audience compared with the size of the EA audience, (2) our belief that they have the most potential for change once they learn about effective animal advocacy (EAA), and (3) the fact that their counterfactual donations seem likely to be less impactful than those of EAs. We have received some feedback on a few of these marketing practices—specifically, we have received feedback suggesting that we might not be advertising in a way that the EA community would most like to see. I will go over a few such examples before sharing why we use our current methods of advertising. At ACE, we are careful to ensure that any matching campaigns are entirely non-illusory. GiveWell has pointed out several problems with illusory matching campaigns. We agree with their reasoning. For example, last year a donor approached us asking about doing a matching campaign to benefit ACE; we declined it because their donation was going to happen whether we set up a campaign or not. However, not all matching campaigns are illusory. For our year-end donation-matching campaign in 2017, we had a donor who would not otherwise have given to our Recommended Charity Fund but who was interested in doing a donation-matching campaign with us. We discussed how a non-illusory campaign might very likely reach a broader audience, inspiring hundreds of new people to participate in effective giving for the first time. We believe this type of influence matching is especially effective with non-EAs. However, as Karnofsky points out, it may be better for existing EAs to ignore the influence matching aspect when making decisions on where to donate—even if we prefer non-EAs to be influenced by them. ACE’s commitment to non-illusory matching campaigns alleviates the concern raised by Jeff Kaufman about counterfactual trust and contradicts the assumptions made by most polled EAs on Facebook. Sometimes even illusory donation-matching campaigns can be beneficial (as Avi Norowitz points out with the Facebook #GivingTuesday retrospective) but this requires special circumstances. We are careful to explicitly note our position on these influence-matching campaigns in our FAQ, and we believe that using them has been a net positive for our non-EA audience. Non-illusory campaigns may cause harm via double-counting. Ben Hoffman has rightfully pointed out that overassignment of credit can obscure opportunity costs with donation-matching campaigns. Given two rational EA actors, believing that each is causing the other to donate may result in a scenario where each is giving less optimally than they’d otherwise choose. However, this example only causes harm if both sides are changing their mind on where to donate due to the existence of the donation match. Overassigning credit isn’t the only way that matching campaign incentives reward dishonesty. In 2016 Benjamin Todd reported that 80,000 Hours had previously run partially counterfactually valid donation matching campaigns, by allowing the donor to commit to delaying funding rather than ensuring that the funding is completely counterfactually valid. Ben Kuhn ran a survey that found that most donors expect matching campaigns to be entirely counterfactually valid, so this remains an issue. We believe using “Double Your Donation” as an advertisement headline strikes that balance well. It is an appropriate shorthand for what is actually occuring: the amount of money that would go to this fund was indeed doubled, and, had the donation match not occurred, our matching donor may have given to a different non-EA cause. As further evidence that these are real counterfactual matches where influenced donations are legitimately doubled, in 2016 and 2017 we surpassed the agreement of what the donor had originally offered to match, after which the donor followed up by continuing the match through these additional donations to more than double what they originally offered toward the matching challenge. Ben Kuhn performed a survey of research on the effectiveness of matching campaigns, concluding that matching campaign effects are generally smaller than we might at first expect, and suggesting that there are more effective ways for large donors to leverage their money. We have no reason to doubt the validity of his analysis, though we do have limited conflicting anecdotal data from our matching campaigns. When we are approached by large donors, we generally try to steer them away from the donation-matching campaigns they are ordinarily used to, advising them to fund general unrestricted programs and administration instead. However, last year we set a funding cap for our own operations; once met, there are only so many other ways that large donors can leverage their money. When a legitimate influence-matching campaign opportunity arises, we don’t think it is inappropriate to take advantage of it at the 1:1 rate, even if the returns may not be as much as you might expect. Anecdotally, we’ve found that our matching campaigns have brought in a disproportionately large number of new donors—the majority of whom were not previously involved with effective giving. While we did not set up a control group, we can report that 73% of the donors to our 2017 matching campaign were first-time donors with ACE, and our post-donation survey showed that over 80% of respondents reported being motivated to give specifically due to the matching opportunity. In addition to the hundreds of thousands of dollars raised by this new audience,³ we were able to teach them about effective animal advocacy and to support them in effective giving elsewhere in the EA movement. The amount that these donors will give to effective charities during their lifetime is significantly higher than the donation-matching campaign that attracted them; we continue to build relationships with these new donors. So while we concur with Kuhn that the raw donation amounts might not be as influenced by a donation match as we may at first think, in our case the flow-through effects seem to more than make up for this difference. Another advertising example that has received some limited criticism from the EA community is our tendency to use cute pictures of animals and catchy messaging in many of our ads. We’ve heard this critique several times in person at EA conferences, although it’s rare to see the argument explicitly laid out online. The idea is that advertising in a way that tugs at people’s fuzzies may be appropriate for direct-level EAA organizations such as The Humane League, but that a meta-charity like ACE should focus solely on arguments for maximizing utility. By posting cute pictures or clever one-liners, we may be misrepresenting the type of work we do. After all, GiveWell’s Facebook feed rarely uses pictures other than to show graphs or their logo; and MIRI’s feed focuses on showcasing data, not cute pictures. We feel that these lines of argumentation misunderstand the role that ACE plays in the EA movement. Yes, we have a core audience of EAs who use our charity recommendations—and yes, those recommendations are based on what we find to be most effective. We fully identify as an effective altruist organization. However, a large portion of our intended audience is comprised of animal lovers who are not yet aware of EA principles. We strongly believe that this is the audience that is capable of making the largest positive change once they learn about effective animal advocacy. Catching their attention via cute animal pictures is the best way we’ve found so far to get them to read more about why effectiveness is important. We have data to support this. We’ve experimented with pushing out various types of Facebook posts to both our current audience (to increase engagement) and to potential new followers. Although we make a point to post a combination of EA-oriented messaging alongside posts that showcase cute animals, the only posts that receive traction significant enough to generate engagement and reach a larger audience are the ones that use fuzzies, not utilons, as the main hook. This feedback loop works to our advantage. Over time, the best performing posts reach non-EA audiences who are likely to be sympathetic to the cause of effective animal advocacy. This allows our brand to grow consistently, introducing new people to the ideas of the EA movement. We’re currently in the process of improving some of our graphs in order to make them more easily shareable. For example, our donation impact page includes a violin plot that shows how many animals we estimate are spared by a $1,000 donation. While the data is accurate, the resulting graph is very difficult to interpret—and is therefore not ideal for sharing at animal rights conferences or on social or journalistic media. The amount of time it takes to explain probability density to passersby at non-EA conferences or to general online audiences looking for a quick picture that explains ACE’s thoughts usually exceeds their (understandably limited) attention span. If we want to reach these audiences, we need to produce graphs that illustrate the point much more efficiently. 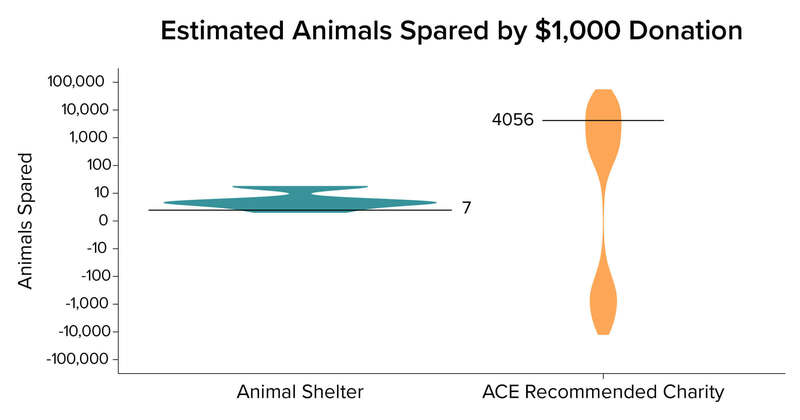 However, sharing just the average estimates (seven animals spared for shelters and 4,056 for ACE recommended charities) could be seen as deceitful, as it doesn’t take into account the uncertainty involved in making these calculations.⁵ Clearly, there is some compromise between a full violin plot and sharing just the mean as the best single estimate for each category. We are still working out where that balance lies. 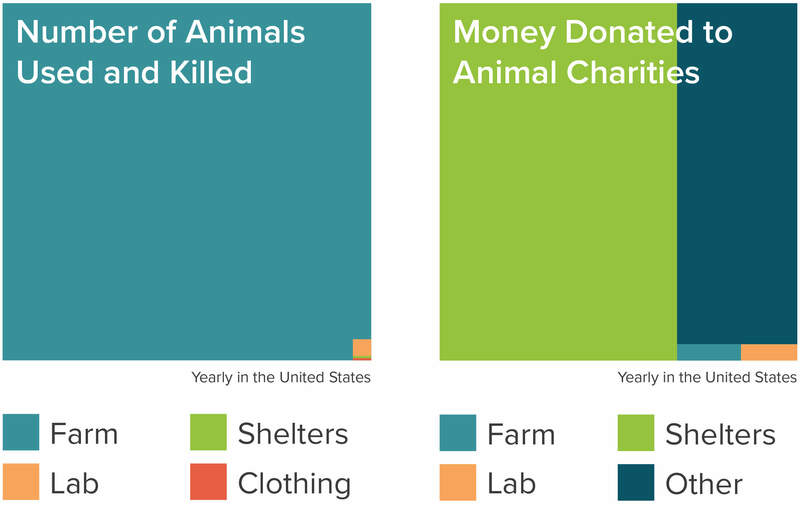 A similar issue comes up with our donation allocation chart.⁶ The data on the left omits wild fishes, who receive almost no portion of animal charity donations. The data on the left also includes animals used for clothing, but the data on the right replaces that category with “mixed or other activities.” On the page, we explicitly point out how the “mixed or other” category was put together, giving an example of guide dog training as one component. This matters because some advocates may consider subcategories like guide dog training as a primarily human-centric charity, not an animal charity, and this might affect the relative size of the chart regions. However, when this chart does gets shared online, it’s generally just the image portion that people will copy and paste. Although these shared images will not include the surrounding text, we believe it is sufficient to include the extra information on our website. We feel similarly with regard to the analogous donation impact chart; including the probability densities as additional information on our site is sufficient, so long as the chart itself includes ranges for our cost-effectiveness estimates. This doesn’t mean we should shy away from all nonprofit marketing best practices. To the extent that we can reach out to new audiences, increase the number of donors who are giving effectively, and grow our brand without compromising what we believe in, we feel that using best practices is both acceptable and desirable. We try to speak in language that non-EA animal advocates already understand when in an appropriate context. This not only means using cute pictures in social media posts, but also talking about projects and interventions that may not be a currently understood top intervention, so long as it reasonably could apply. We use multivariate testing on social media adverts and email campaigns, but we are careful to only test messaging that matches our brand and to only use subject lines that accurately convey the content of each email. We segment our audience, showing different information to different audiences, while being careful not to cut information sent to various audiences in a way that might be seen as deceitful. Specifically, we take care to only show different content based on the different interests of our audience; we do not alter the meaning behind our messages when segmenting our audience. We use a Google ad grant and SEO efforts to gain traffic from audiences not yet familiar with effective animal advocacy, without deceiving visitors as to what they will see once they visit. We track key performance indicators to judge how effective our communications strategies perform, but are careful not to focus on quantity at the expense of quality. We create videos that appeal to a general audience through fuzzies in addition to posting videos of webinars and symposium talks. We take advantage of opportunities to direct more funding to effective animal charities, such as running a non-illusory matching campaign that is very likely to inspire new people to give effectively. While we are careful not to blindly follow marketing best practices, we nevertheless utilize them when they don’t interfere with our values. We prize integrity and take care to exhibit norms of honesty when following accepted marketing principles. We do not use “rhetorical tricks” nor “sales techniques” to convince others; our use of imagery is solely used to gain attention. Arguments for EAA on our site are fully transparent, and we both accept and encourage feedback on the research we perform. I’m proud to report that we are continuing to grow our brand, increase the number of donors who are giving effectively, and introduce new audiences to effective animal advocacy. In December last year, we raised over $1.26 million for our Recommended Charity Fund⁸—a significant portion of which came from extremely generous first-time donors not already identifying themselves as EAs. Of course, we couldn’t achieve these results for our recommended charities without the support of EAs, who so generously helped to fully fund ACE directly last year, but the larger point is that these strategies are encouraging non-EAAs to donate to more effective causes and are making a subset more aware of effective altruism in general. If you work with an EA organization, we would love to hear about the marketing/communications techniques and/or successes that you’ve had when promoting EA organizations. We’d also like to hear if anyone has any concerns about ACE or any other EA charity using these kinds of marketing techniques. Are you comfortable with ACE’s methods of using donation-matching campaigns? Do you agree that marketing with fuzzies is acceptable even for a charity evaluator like ACE? What’s the minimal amount of information our shareable images should convey?⁹ Do you feel that the way ACE follows nonprofit marketing best practices is appropriate? ² In November 2017 we initially used the phrase “This means that you can double the impact of your donation from now through the end of the year by donating to our Recommended Charity Fund” in at least one marketing material, but after receiving feedback from both ACE staff members and outside EAs (including Remmelt Ellen and Marianne van der Werf—thank you to both!) we standardized to the “double your donation” language instead across all marketing materials. In previous years we were less strict about our language, using “Double Your Impact” in several advertisements during the 2015 and 2016 giving seasons. We did not make this choice blindly; at the time, we felt that “double your impact” and “double your donation” were different mostly in what kinds of audiences they attract, and that this overrode any concerns about one being more strictly accurate than the other. “Double your impact” emphasizes the effect of helping others, whereas “double your donation” emphasizes what one can personally accomplish.